Frederik February 09, 2017 Comment? The trailer and poster for “Unlocked” has been released today, and it looks very good. That being said, the film has been awaiting theatrical release for over three years, so one was worried what could have gone wrong. 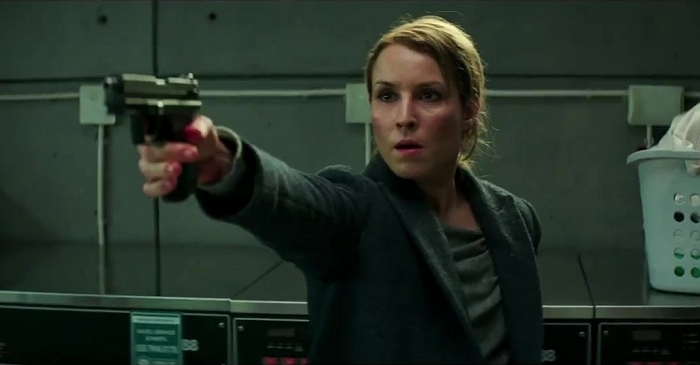 London is under biological attack from terrorists in Unlocked, and only Noomi Rapace has the key. Rapace stars as a CIA operative who finds her mission compromised. She’s forced to team up with an MI5 agent, played by Orlando Bloom, to track down the terrorist infiltration and prevent a major attack. Along the way, she’s ably assisted (or hindered?) by the likes of Michael Douglas, Toni Collette, and John Malkovich. Quite a cast. Veteran British director Michael Apted is behind the camera on this one, which makes sense given his Bond pedigree on The World Is Not Enough. Unlocked arrives on 5 May. Screencaptures have been added to the photo gallery, alongside the film’s poster.